With AURA Music Fest just around the corner, we thought we’d catch up with some of the bands that will be rocking and grooving the festival this year. The first, is a funk fusion band called Kung Fu that have a unique blend of 70′s groove and electronic dance. We caught up with them and talked influences, live shows, and yes, a little kung fu. Do any of you actually do Kung Fu? Tim Palmieri: I practiced Kempo karate when I was a kid. 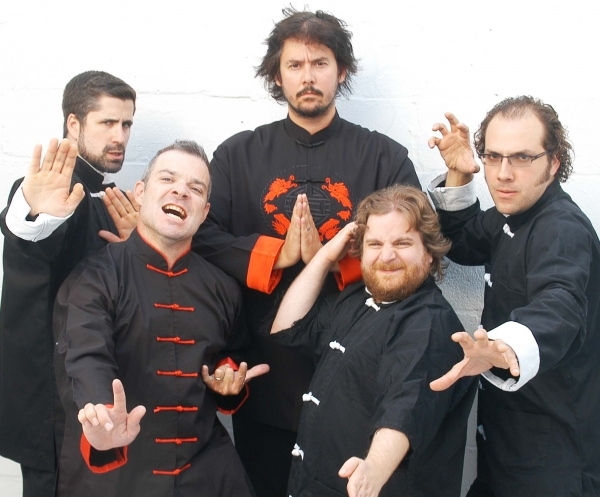 Each member of Kung Fu is also a member of at least one other band. How does your individual involvement with other musical projects play into the songwriting and dynamic of Kung Fu? Tim Palmieri: We all of our own individual influences and experiences with other bands but the musical direction of Kung fu is different than all the other projects. Elements can seep in but Kung Fu is unique in its musical flavor. Do you approach performing live in the mindset of a jam band, or do you have a set plan prior to going on stage? TP: The set is always planned out in advance. There aren’t any long free jams but instead improvisation within the structure of our compositions is our game. Within that solo we can be new and creative and everyone’s response time is really quick so it allows us to not be repetitive in jams. Speaking of concerts, this year you’ll be performing two sets at AURA Music & Arts Festival. What are you most looking forward to? How do you think it will compare to other festivals you’ve been a part of and to AURA last year? TP: Looking forward to it all. All festivals have their charm and AURA’s charm I think is a real tight knit family vibe. Your music has a very distinct fusion of funk and dance music. What are some bands/musicians from both genres that you find have influenced your music? TP: Parliament Funkadelic, Herbie Hancock, James Brown, Stevie Wonder, and the list goes on! Besides touring, what are your musical plans for 2013? TP: Finishing and releasing our second album, making videos, and perfecting our being.